PHP 7.0 promises substantial speed improvements over previous versions of the PHP language, brings with it many new features, and continues the work on modernizing the PHP language. 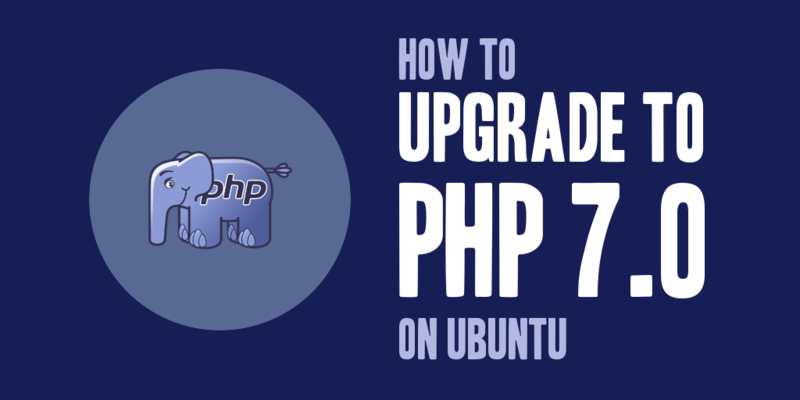 This guide explains how to upgrade to PHP 7.0. Why Upgrade to PHP 7? In comparison to PHP 5.5.x, the performance increase is even more significant! This tutorial assumes that you are running PHP 5.5.x on an Ubuntu machine (Ubuntu 14.04 was used for this tutorial). This tutorial also assumes that you’re using mod_php in conjunction with Apache2, and that you have sufficient access rights (root access) to install and maintain your own server. What is a PPA package? A Personal Package Archive, or PPA, is an apt repository hosted on Launchpad. PPAs allow third-party developers to build and distribute packages for Ubuntu outside of the official channels. You will want to to identify the currently installed PHP packages on your system. You can do this by executing the dpkg package manager in the following manner and piping the contents to the grep command to determine what php packages have been installed. Using the list of PHP packages that were identified, create a new command that will install all applicable PHP 7 packages. Based upon the list above, the following commands would be used to update to the PHP 7 packages. This should produce output similar to that below. This will confirm that your server is running PHP 7. The next step, if you’re running an Apache2 server is to enable the PHP 7.0 module on your Apache2 installation. You’ve already taken care of installing the PHP 7 module when you installed the libapache2-mod-php7.0 package, so we can go ahead and simply disable and then enable the proper PHP module. And there you have it! Your website should be using PHP 7! If you want to learn more about PHP 7 and what it can do for your applications and websites, you can find more information here: PHP 7 makes powering the web a whole lot better. If you have any questions on what might be affected in your code, you can reference the PHP 5.6.x to PHP 7.0.x migration guide at PHP.net.